Since joining Hunton Andrews Kurth in 2008, Melissa has contributed more than 750 hours to pro bono service. 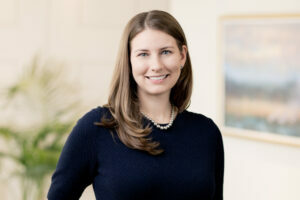 Melissa leads the firm’s pro bono partnership with Wells Fargo’s Law Department, in which volunteer lawyers from Hunton and Wells Fargo team up to help disabled adults appeal Medicaid denials. The process includes gathering medical evidence and representing the client during the administrative hearings and in state court through the Charlotte Center for Legal Advocacy’s Family Support and Health Care Initiative. Melissa was a recipient of Hunton’s E. Randolph Williams Award for Outstanding Pro Bono Service in 2008-2009 and 2012-2013. She was also selected to the Charlotte Center for Legal Advocacy and Legal Aid of North Carolina’s Pro Bono Honor Roll in 2015. Melissa was also inducted into the second class of the North Carolina Pro Bono Honor Society in 2017 through the NC Pro Bono Resource.